Taylor, Z. J. and Shih, A. Y. (2013). Targeted Occlusion of Individual Pial Vessels of Mouse Cortex. Bio-protocol 3(17): e897. DOI: 10.21769/BioProtoc.897. Targeted photothrombosis is a method to occlude individual arterioles and venules that lie on the surface of the cerebral cortex. It has been used to study collateral flow patterns within the pial vascular network following occlusion of single surface vessels (Schaffer et al., 2006; Blinder et al., 2010; Nguyen et al., 2011), as well as to generate localized ischemic strokes following occlusion of single penetrating vessels (Nishimura et al., 2007; Drew et al., 2010; Shih et al., 2013). The intravascular clot is formed by irradiation of a target vessel with a focused green laser after injection of a circulating photosensitizing agent, Rose Bengal (Watson et al., 1985). We briefly describe modifications of custom-designed and commercial two-photon imaging systems required to introduce a green laser for photothrombosis. We further provide instructions on how to occlude a single penetrating arteriole within the somatosensory cortex of an anesthetized mouse. With a custom-designed two-photon imaging system (Tsai et al., 2002), a green laser beam is introduced into the imaging beam path with dichroic mirror 1 (625 DRLP) (Figure 1) (Shih et al., 2011). The beam is adjusted to pass through a 3.5 mm diameter clearing etched in the dielectric coating of dichroic mirror 2 (700 DCXRU) (Figure 1). 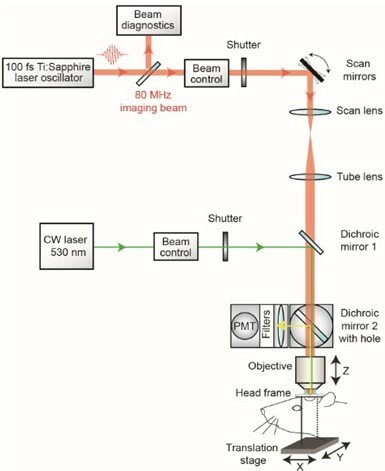 This allows transmission of the green laser to the back aperture of the objective lens, while still reflecting > 90% of emitted light from the sample toward the photomultiplier tubes (PMTs). The result is a fixed green laser beam, focused within the center of the imaging field. A shutter placed within the green laser path (LS3Z2 Uniblitz and VMM-D1 driver) will allow control over its on-off time. During occlusion of a vessel, irradiation can be periodically interrupted for brief epochs of imaging. Typically 1 frame (0.2 sec per frame) every 1 sec for an 80% duty cycle. This permits real time observation of the formation of the clot (Schaffer et al., 2006). Figure 1. Schematic of custom-designed two-photon system modified to introduce a continuous wave green laser beam. (CW) continuous wave, (PMT) photomultiplier tube. The beam control module for the green laser refers to a neutral density filter to attenuate the laser intensity to a level suitable for photothrombosis. A ~ 3.5 mm diameter hole is etched in the coating of dichroic mirror 2 to allow the green laser to pass while the PMT assembly is in place, thereby allowing visualization of clot formation in real-time. Components and instructions to adapt a custom-designed two-photon system (Tsai et al., 2002) for targeted photothrombosis are provided in Shih et al. (2011). For the enclosed design of commercial two-photon imaging systems, there is often limited space within the microscope for additional optomechanical components. 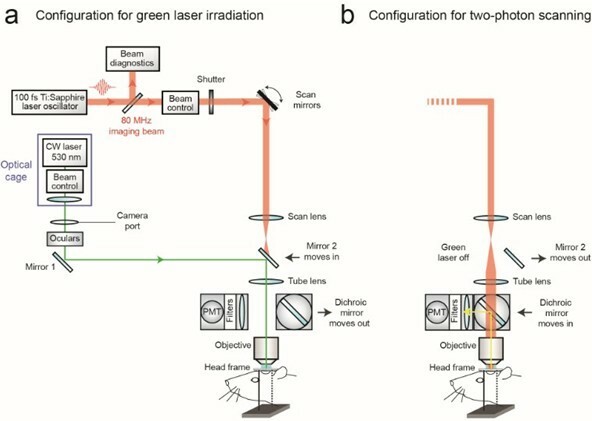 Here we illustrate how the green laser may be introduced through the camera port of a Sutter Movable Objective Microscope (MOM), using a custom green laser module described by Sigler et al. 2008. The port is located above the ocular lenses, as is the case for most commercial microscope systems (Figure 2a). This path leads to a movable mirror (mirror 2) already located within the Ti-Sapphire imaging beam path between the scan and tube lenses. The green laser is then deflected toward the back aperture of the objective. When transitioning from two-photon to wide-field imaging mode with the MOM system, built-in servo-motors move mirror 2 into the beam path and move the primary dichroic above the objective out of the path synchronously (Figure 2a). This allows the green laser to pass to the objective. In this configuration, however, one will be not be able to visualize the formation of the clot in real-time. 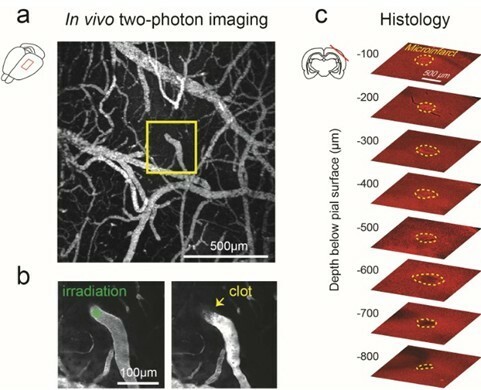 Rather, the extent of clot is monitored in between epochs of continuous irradiation (30 sec), by transitioning back to two-photon imaging mode when the green laser is off (Figure 2b). Finally, while not discussed here, another entry point for the green laser is through an epifluorescence filter slot, as described in detail by Sigler et al. (2008). Figure 2. Schematic of commercial two-photon system (Sutter Movable Objective Microscope) modified to introduce a continuous wave green laser beam through the camera port. The beam control module refers to a neutral density filter to attenuate the laser intensity to a level suitable for photothrombosis, and a polarizing filter on a rotation mount for finer adjustments of intensity (see Sigler et al., 2008 for detailed instruction for green laser assembly for camera port). A single plano convex lens, rather than the lens doublet described by Sigler et al. 2008, is added to the optical cage assembly to ensure that the beam is collimated after it passes through the tube lens of the microscope. The beam control module and lens are housed in an optical cage generated from Newport parts, which is bolted to a C-mount adaptor that fits into the camera port. The PMT assembly is moved out of the imaging beam path to allow the green laser to pass. With both custom and commercial two-photon imaging systems, additional optics may be necessary to adjust the power of the green laser and modify the diameter of the beam, depending upon the system. Power control is typically achieved by adding a neutral density filter and/or polarizer filter on a rotation mount (Sigler et al., 2008; Shih et al., 2011). The power of the green laser at its focus after the microscope objective should range between 0.5–1 mW. The green laser beam should under fill the back aperture of the microscope objective, in order to generate a relatively large 3 to 5 μm diameter region of photoactivation within the center of the imaging plane. The beam should also be collimated to ensure that the green laser is focused at the imaging plane. It may therefore be necessary to add lenses to alter the beam diameter and/or adjust for convergence/divergence of the green laser caused by other lenses within the beam path. For example, with the Sutter MOM system an additional plano convex lens (LA1978-A) was added to reduce convergence caused by the tube lens (Figure 2a; located within optical cage system). All necessary optics can be housed together with the green laser using cage systems available from ThorLabs or Newport, and then mounted on the camera port as a single unit, similar to that described by Sigler et al. (Figure 2a) (Sigler et al., 2008). We now describe the procedures involved in occluding a single penetrating arteriole in mouse cortex using a green laser beam coupled through the camera port of a Sutter MOM. Before imaging, locate the focus of the green laser within the imaging plane by bleaching a piece of filter paper soaked with FITC-dextran solution. Cut a 1 x 1 cm piece of filter paper and place it in a culture dish. Cover the paper with 50 μl of FITC-dextran and overlay it with a coverslip. Place a drop of distilled water onto the surface of the cover glass and bring the filter paper into focus at the eyepiece. Use the same objective lens that you would use for photothrombosis (i.e., 20x, 1.0-NA). Use the translation stage to find an area free of bubbles. Turn off the PMTs and transition to wide-field mode. Ensure the cameral port is open and that the green laser passes through the objective. Irradiate the sample for 30 sec and then deactivate the beam. Transition back to two-photon imaging mode. An area of the filter paper should now be bleached, marking the focus of the green laser beam. Place a clear piece of tape on the computer screen over the bleached area. Use a pen to mark the location of where the laser is focused. Repeat the bleaching procedure in a different location to ensure that the location of irradiation is consistent. This procedure requires optical access to the brain either through a skull-removed, which has been described in detail in past publications (Mostany and Portera-Cailliau, 2008; Drew et al., 2010; Shih et al., 2012a; Shih et al., 2012b) or thinned skull cranial window (Holtmaat, 2009). A method of fixing the head of the mouse for imaging is also required (Shih et al., 2012b). Anesthetize the mouse with isoflurane and affix the animal’s head in the optical imaging apparatus. The apparatus should have a method of delivering isoflurane continuously to provide anesthesia throughout the procedure. Administer 25 μl of FITC-dextran through the tail vein or retro-orbital vein to label the blood serum. Using a low magnification objective (i.e., 4x, 0.16-NA), take an image stack (200 μm deep, 5 μm steps) of the pial vasculature through the cranial window. A maximally projected image of this stack is used as a map to provide guidance when using higher magnification objectives (Figure 3a). Figure 3. Generation of cortical microinfarct by targeted photothrombosis in mouse cortex. a. low magnification, maximally projected image of pial vasculature visualized through a thinned skull PoRTS window (Drew, 2010). The vasculature is labeled with intravenous FITC-dextran. A single penetrating arteriole within the window is identified for photothrombosis (inset). b. Green laser irradiation of a single penetrating arteriole (left panel) immediately following intravenous administration of Rose Bengal leads to localized clotting (right panel). After successful photothrombosis, a dark clot is seen at the site of irradiation and the vessel becomes brighter upstream due to stagnation of red blood cell flow. c. Post-mortem immunohistochemistry with the pan-neuronal marker NeuN demarcates the boundaries of the resulting microinfarct (yellow-dotted line), as observed 48 hours following occlusion. Exchange the low magnification lens for a high magnification objective (i.e., 20x, 1.0-NA). Place a drop of distilled water over the cranial window and bring the pial surface into focus. Navigate within the cranial window using the image made with the low magnification objective. Locate the neck of a penetrating arteriole just before it descends into the cortex. Penetrating arterioles branch from the surface arteriolar network and descend into the brain (Blinder, 2010; Shih, 2013). To confirm the identity of the target, use two-photon microscopy to image deeper layers of cortex and ensure that it penetrates into the brain. Once verified, return to the pial surface and maneuver the location of the green laser focus into the lumen of the target vessel by moving the microscope stage. Inject 50 μl of Rose Bengal solution through the tail vein or retro-orbital vein. Immediately irradiate the vessel with the green laser focus for 30 sec. Return to two-photon imaging mode. The vessel should now be occluded. A successfully occluded vessel will show no dark streaks caused by the movement of red blood cells. There will typically be a dark thrombus with a bright region of stagnant serum directly upstream (Figure 3b, right panel). If the vessel fails to occlude, the photothrombotic procedure may be repeated. Irradiation must be performed within 5 to 10 min after intravenous injection of Rose Bengal as the dye is quickly extravasated from circulation (Zhang and Murphy, 2007). The vessel should be re-examined after 1 h to ensure the vessel has not de-occluded. De-occlusion can sometimes occur with large penetrating arterioles. The occlusion of a single penetrating arteriole will result in a columnar region of ischemia in mouse cortex ranging from 300 to 500 μm in diameter and can often span the entire depth of cortex (Drew et al., 2010). This region of ischemia will eventually become infarcted and the discrete boundary between viable and infarcted tissue can be delineated with post-hoc immunohistology (Figure 3c). Our work is generously supported by grants to A.Y.S. from the NINDS (NS085402), the Dana Foundation, and South Carolina Clinical and Translational Institute (UL1TR000062). Blinder, P., Shih, A. Y., Rafie, C. and Kleinfeld, D. (2010). Topological basis for the robust distribution of blood to rodent neocortex. Proc Natl Acad Sci U S A 107(28): 12670-12675. Drew, P. J., Shih, A. Y., Driscoll, J. D., Knutsen, P. M., Blinder, P., Davalos, D., Akassoglou, K., Tsai, P. S. and Kleinfeld, D. (2010). Chronic optical access through a polished and reinforced thinned skull. Nat Methods 7(12): 981-984. Kleinfeld, D. and Delaney, K. R. (1996). Distributed representation of vibrissa movement in the upper layers of somatosensory cortex revealed with voltage-sensitive dyes. J Comp Neurol 375(1): 89-108. Mostany, R. and Portera-Cailliau, C. (2008). A method for 2-photon imaging of blood flow in the neocortex through a cranial window. J Vis Exp(12). Nguyen, J., Nishimura, N., Fetcho, R. N., Iadecola, C. and Schaffer, C. B. (2011). Occlusion of cortical ascending venules causes blood flow decreases, reversals in flow direction, and vessel dilation in upstream capillaries. J Cereb Blood Flow Metab 31(11): 2243-2254. Nishimura, N., Schaffer, C. B., Friedman, B., Lyden, P. D. and Kleinfeld, D. (2007). Penetrating arterioles are a bottleneck in the perfusion of neocortex. Proc Natl Acad Sci U S A 104(1): 365-370. Schaffer, C. B., Friedman, B., Nishimura, N., Schroeder, L. F., Tsai, P. S., Ebner, F. F., Lyden, P. D. and Kleinfeld, D. (2006). Two-photon imaging of cortical surface microvessels reveals a robust redistribution in blood flow after vascular occlusion. PLoS Biol 4(2): e22. Shih, A. Y., Mateo, C., Drew, P. J., Tsai, P. S. and Kleinfeld, D. (2012). A polished and reinforced thinned-skull window for long-term imaging of the mouse brain. J Vis Exp (61). Shih, A. Y., Driscoll, J. D., Drew, P. J., Nishimura, N., Schaffer, C. B. and Kleinfeld, D. (2012). Two-photon microscopy as a tool to study blood flow and neurovascular coupling in the rodent brain. J Cereb Blood Flow Metab 32(7): 1277-1309. Shih. A.Y., Nishimura. N., Nguyen. J., Friedman. B., Lyden. P.D., B. S.C., Kleinfeld, D. (2011). Optically Induced Occlusion of Single Blood Vessels in Neocortex. In: Imaging in Neuroscience: A Laboratory Manual (Helmchen F, Konnerth A, Yuste R, eds), p. New York: Cold Spring Harbor Laboratory Press, Chapter 85, 939-948. Shih, A. Y., Blinder, P., Tsai, P. S., Friedman, B., Stanley, G., Lyden, P. D. and Kleinfeld, D. (2013). The smallest stroke: occlusion of one penetrating vessel leads to infarction and a cognitive deficit. Nat Neurosci 16(1): 55-63. Sigler, A., Goroshkov, A. and Murphy, T. H. (2008). Hardware and methodology for targeting single brain arterioles for photothrombotic stroke on an upright microscope. J Neurosci Methods 170(1): 35-44. Tsai, P.S., Nishimura, N., Yoder, E.J., Dolnick, E.M., White, G.A., Kleinfeld, D. (2002). Principles, design, and construction of a two photon laser scanning microscope for in vitro and in vivo brain imaging. In: In Vivo Optical Imaging of Brain Function (Frostig RD, ed), pp 113-171. Boca Raton: CRC Press. Zhang, S. and Murphy, T. H. (2007). Imaging the impact of cortical microcirculation on synaptic structure and sensory-evoked hemodynamic responses in vivo. PLoS Biol 5(5): e119. How to cite: Taylor, Z. J. and Shih, A. Y. (2013). Targeted Occlusion of Individual Pial Vessels of Mouse Cortex. Bio-protocol 3(17): e897. DOI: 10.21769/BioProtoc.897.